"Today I’ve quick review of a rather unique and useful product from Bracketron called the Nav-Mat III which is a portable GPS mount for the dash of your car. 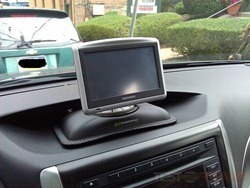 It couldn’t be simpler to use really, it just sits on your dashboard and you attach your GPS to it. Well it’s a little bit more than that, so read on to learn more about it…"